We wanted to camp, but what about our dogs? This weekend Tod and I not only hiked in Catoctin, but we camped too. We decided to camp the easy way, with our big tent and with plenty of supplies. A few weeks ago we camped without our dogs. Dash is a cavalier king charles spaniel and doesn’t have the stamina for a long hike. Mocha, a cocker spaniel, is both blind and deaf. Since Catoctin Mountain Park is only an hour from home, we thought we might pitch the tent after our hike, pick up the dogs from home, and have a pleasant evening of camping in the woods. It turned out to be quite an experience. Dash was full of anxiety every time one of us left the camp site to use the restroom or get water. Mocha had an uncanny ability to get his leash tangled. Getting settled in the tent was pure chaos! Mocha paced around the tent and Dash followed. Finally, when we thought things had settled down we heard a dog barking outside. “Boy, that dog sounds a lot like Dash, ” I said. And where was he? Outside! We have no idea how he got out but he managed to wiggle out. Next, about two hours later, we noticed some animal pacing around the outside of our tent. Turns out it was Mocha! Needless to say, no one got any sleep. In the morning, both dogs raced to the car the minute we let them out. I’m guessing we’ll go back to finding a dog sitter next time we hit the woods. 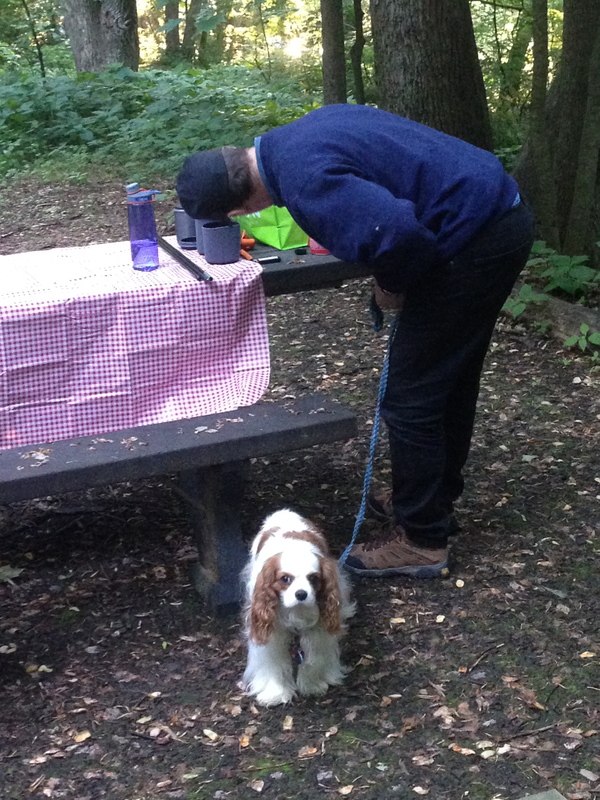 This entry was posted in Maple's Jots on Jaunts and tagged camping, camping with dogs, Catoctin Mountain Park by Maple. Bookmark the permalink.